The JetBlue Pilot Gateway Programs have helped crewmembers and students find their way to the right seat at JetBlue for many years. The lauded University Gateway Program is the most robust, student-focused gateway in the U.S. industry while our internal crewmember to pilot paths provide the support and mentorship necessary for JetBlue crewmembers to realize their career goals. Read on to learn more about your path to becoming a JetBlue pilot. Are you a qualified pilot ready to become a JetBlue first officer? Apply to join our cadre of professional aviators and help us inspire humanity every day. Establish your path from an aviation university to JetBlue. An innovative new path to become a JetBlue pilot in four years. A special opportunity for JetBlue pilots to sponsor a fellow pilot. An exceptional opportunity for JetBlue crewmembers to step away to build flight experience and earn a guaranteed interview. A unique program for JetBlue instructors to become pilots. 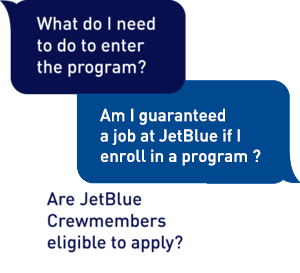 For JetBlue crewmembers with the desire and qualifications to become a pilot.